The former Battery Hotel was bought by MUN last year and is likely to be used as a student residence. Students often use public transit and the closest busline to the Battery is line 15 running to MUN campus. 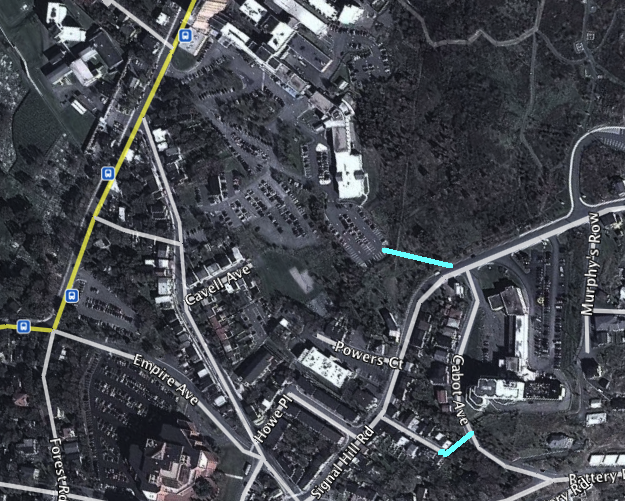 It would be good for both Metrobus and MUN to build a couple of shortcut walking trails as indicated below in blue. These would reduce the distance to a bus stop to under half a kilometre and also help transit users avoid the steep climb from Military Road.